High quality products and services that is the Hallmark of Geolife, is made available through our excellent supply and distribution network. With around 3,000 distributors spread across India, we strive to make our products and services reach and benefit everyone. At the end of the day, a better understanding of the future is what is important. In lieu of this, Geolife keeps interacting with the end users employing the ear-to-the ground approach. All this feedback help us to research more and come up with products that suits the needs of the market and are sustainable in the future run also. 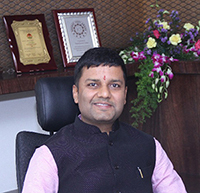 Mr. Vinod Kumar Lahoti Chairman and Managing Director of Geolife Group ventured into the business while completing his Executive MBA and made a way for residue free farming and promoting Organic Food Technology. Not only India, Geolife Group has made strong footprints in various countries all under the able guidance of Mr. Vinod Lahoti. His ability to prioritize and deal effectively with a number of tasks simultaneously reinforced with his skills to make decisions, be accountable, meet/exceed goals and achieve high-quality results, has metamorphosed the business venture into one of the fastest growing Agro nanotechnology company, one can see a clear edge that Mr. Vinod Lahoti lends to every project he takes upon. He firmly believes in promoting organic inputs to achieve residue free food and hence increase yields all through organic means. He and his experienced team at every step strive to bring up eco-friendly range of products and thus contribute towards greener today and greener tomorrow. The company’s punchline says it all: “Think Organic, Grow Organic and Eat Organic”. Geolife today has a strong presence felt across 19 states of the country and if this is less, have a look at how exponentially he has taken the company forward at the international front as well. Geolife has tie ups with companies in different continents. Seeing his contribution, Mr. Vinod Lahoti has been conferred with Bharat Jyoti Award in 2017, Most Influential Rural Marketing Award and Recognition for contribution to community in USA, 2014 and other international awards for achieving business success and his contribution to social welfare in a short span. Mr. Lahoti has shown excellent business acumen and have also ventured into different industries domain like Health Care, Seeds, Corporate Farming, Organic Food, Animal nutrition and Specialty fertilizers to name a few. He is an active member of various national and international business organizations and had delivered speeches at different international and domestic events like CNCIC, China, Agri Biostimulants and many other domestic events. A gentleman at heart, Mr. Vinod Lahoti started Geolife Foundation to give back to the society and' contribute in every big or small way he can. Mr. Vinod Lahoti is truly an inspiration for the budding business entrepreneurs as it is not only business nuances one can learn from him but how well he manages to strike a perfect balance between personal, professional and social life is worth learning.